Quite by accident rather than design, the garage had two examples of transportation on two wheels side by side. It provided an excellent opportunity to study two very different approaches to the European motorcycle market in the same year. That year was 1956. Yes 1956, when the Suez crisis in Egypt had the world stage, a gallon of gas in the USA cost 22 cents, while petrol was rationed in Britain, and Elvis broke onto the scene on the Ed Sullivan show, while Castro starts the Cuban Revolution, racial unrest spans the US, Real Madrid wins the first European Cup, Kruschev denounces Stalin, the 1st motorcycle rode over 200 mph (Wilhelm Herz-210 mph/338 kph).......it is against this rich backdrop that motorcyclists receive the BMW R26, and the Norton Dominator 99. I know, I know, a single and a twin, chalk and cheese, apples and orangutans. True, but they are at once a contrast and a similarity in approaches beyond the obvious, so stick with us on this. Truth be told, both bikes are evolutions. The Norton is a displacement bump and the legendary introduction of the featherbed frame (see who framed Norton). The BMW is the a continuation of the singles produced since prewar times with some key improvements. A very good review of the R26 was done by Motor Cyclist at the time and is reproduced on the Benchmarks Motorworks site. It points out the first similarity, they were both "high performance" versions of a pre-existing machine. For a single, the 247cc R26 produced 15HP, and delivered a tested top speed of 73MPH against a listed top speed of 79MPH. This was significantly improved over the previous R25, and a sidecar was an option chosen by quite a few buyers. 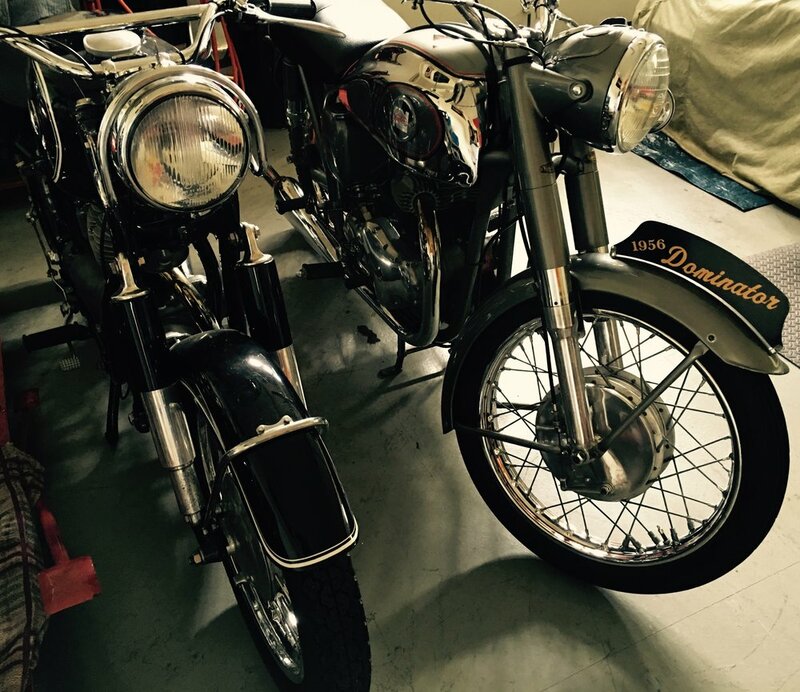 As for the Dominator, there are multiple books on the model, and an overview by Classic British Motorcycles. The upgraded 600cc engine produced 31HP, and was good for just over the magical ton of 100MPH. Both had finned cylinders and heads to help with cooling. The R26 was a completely revised frame with a rear swing arm, Earle's fork, and an enclosed drive shaft. This dramatically improved handling both for competition and for more utilitarian sidecar duty. The Norton was also revolutionized by a new chassis. Mounting all of the Dominator components in the featherbed frame became the basis for almost 2 decades of competitive performance. The Roadholder telescopic forks became a further marketing focus, making the Norton "Unapproachable". The Earle's forks on the BMW were well regarded for stability and sidecar work. The gauges are mounted in the headlight nacelle on both machines. 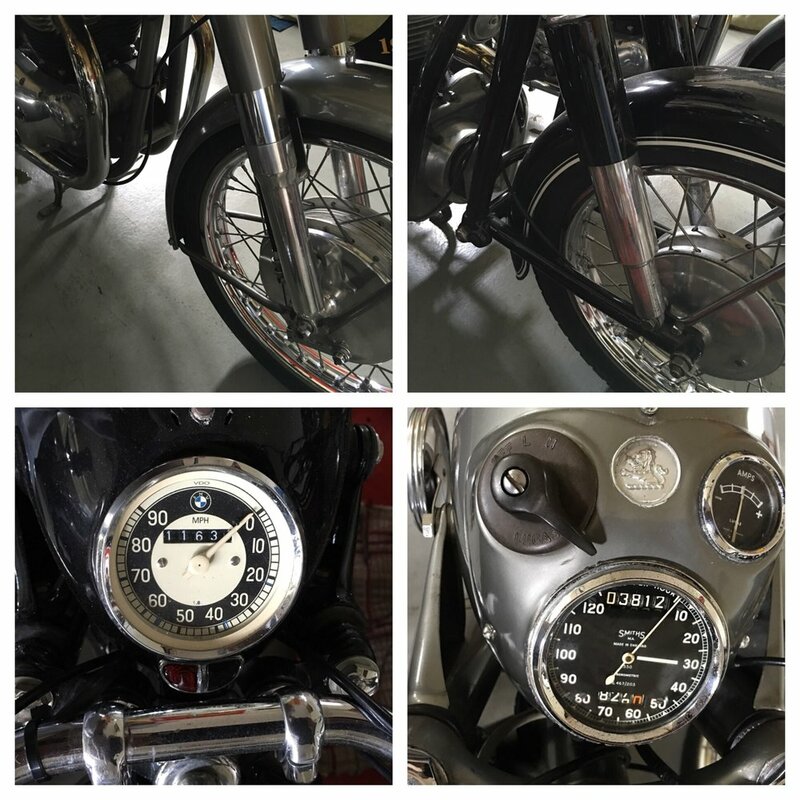 both have an all-in-one speedometer, odometer, with the Norton adding a trip meter. The Norton also boasts an ammeter, Neither headlight was very good unless the machine was running at full charge from the Dynamo. Neither had turn signals, although both could. The R26 tank is classic BMW black and pinstripe, with a lockable storage compartment on top. The Norton tank is one of the most beautiful to adorn a production motorcycle (in our humble opinion) with its' silver and chrome scheme. Fuel flows from the tank to a single Amal carb for the Norton, and a single Bing for the BMW. Both come equipped with an air pump. Of course, there are many contrasts. Propulsion is the aforementioned shaft for the R26, and chain for the Norton. The Dominator has a well padded seat with good room for a passenger. The BMW has a single Pagusa seat that is spring-mounted to further help with suspension. Although the BMW frame was new, it was still a plunger type frame compared to the state of the art featherbed. The Norton has their traditional oil tank arrangement, while the BMW has their traditional wet sump arrangement. Right side kick starter and foot shift on the Dommie, versus left side for both on the Beemer. Bosch versus Lucas for electrics, and rod-operated rear brakes on the R26 versus cable on the Dominator. The Norton front brakes are noticeably larger, and were mentioned in reviews as being very good stoppers. The German was relatively simple and oil tight, while the Norton had bevel drives and leaked from the primary case even when new! Both machines included large helpings of their company's heritage and signature approaches. Both were introduced as higher performance upgrades of prior models, and both introduced suspension/handling improvements. However, you could clearly see how BMW was sticking to more conservative evolution, while the Norton was breaking new ground. BMW was working on practical transportation that could be transformed for competition versus Norton who continued to capitalize on a competition heritage to "Race on Sunday and sell on Monday".